I just realized that I forgot to tell you all that David submitted his Dissertation paperwork for his Phd and will go to defend October 12. Xander and I are very proud of him. With so much going on I thought I had posted on here about this but I just realized that I had not. Everyone at Tech has taken to referring to David as Dr. Brown. He is already setting up contacts and possible projects to work with others on papers to be published. He is well known by a lot of the upper administration at Tech and by a lot of the donors as well. Xander came home yesterday and was telling me that he had already volunteered his dad at school, and when I asked “Oh, what for?”. Xander responded that they are studying the human skeleton and organisms and that he was telling his teacher about his dad’s VR Cave (Virtual Reality Cave System) and Oculus (Rift) and how he had a human body you could stick your head in and see inside the body heart, veins, etc. I asked him if he meant organs like kidney etc and he was no organisms like the human body is made of. Xander has been in school for almost 2 months and while he has been scared about his grades, he is currently A/B Honor Roll. In the band at school, he of course plays the drums. Well he is in the 7th & 8th Grade Band and plays at all the home football games. He chose to play the base drum. I was able to tape one of the songs they played at one of the games. The band members who are on the football team come play the anthem and school song before running back to the team to play, and there are about 3 or so band members who are on the football team. Of course there are at least that many who play on Xander’s Lacrosse team. I have now been in school a few weeks. I have already written and turned in 3 history papers (1 of which was a bonus not required paper), had 1 quiz in math and another one tomorrow, several little astronomy projects and about to be more, 4 homework assignments for Microeconomics and I have done 1 presentation by myself in PC (communicating in the business place), which today we formed our first team for presentation 2 which due in October and we had a quick improv presentation. Overall we all did well. Going to be a very busy semester for us all. I found a new free cloud drive. Don’t get me wrong I like Box, Dropbox, One Drive, Google Drive, Media Fire, but I recently found Mega and they give you 50 gb of space for free. I am taking 16 credit hours again this fall and still working part-time at Kohls. I have the following classes: Microeconomics, Concepts of Calculus, Astronomy, American History II and Communicating in the Work Place. Hopefully I do well in these classes. My American History II Professor has already giving us access to the instructions for our 5 home works with their due dates, so we can actually complete them all now. He has what he calls Text Book Bonus Assignments, they are extra credit that you do not have to do but the instructs to them are only released 1 week before they are due. There are 5 of the Bonus Assignments and they totally are worth half of the all Homework totals. The Communicating in the Work Place has 4 presentations you have to do. The first presentation is by yourself, introducing yourself to the class with 3 slides. The next 2 presentations are group projects and you will be assigned to different groups for each presentation project. The fourth is you doing a video presentation that you will have to upload to Vimeo. Concepts of Calculus is lecturing with homework you don’t turn in, but if you don’t do it you might not make as good a grade on the quizzes as you would have. He does not use a physical book, saves you money there, he does have a pdf of the book he is teaching out of, that he has sent to everyone. He has a rule of no electronics and no calculator, he said his math class is designed so that you should not need them. He does not have any online component to the class. Astronomy their is an online component and a lab workbook that you will use, there is no other book besides a lab book for this class. Microeconomics is lecturing and responding in class, with a few exams, there is an online component where you will do your homework. I think I am going to be busy this Fall. 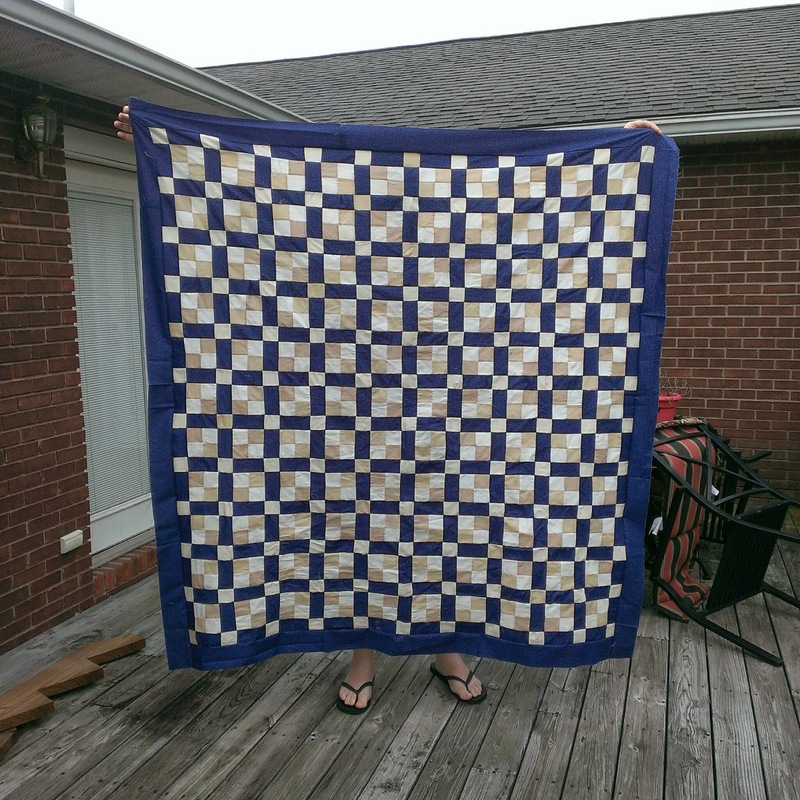 I still did not get to quilting after classes let out in May. I took Algebra 1830 in June and made a C in the class. Monday, July 6th, I started taking Human Geography, that day after class I stopped by the office of my Math teacher from June to see my final exam. I missed him by 5 minutes, as I went to leave the building, I stepped out and went to walk down the concrete steps and my ankle twisted and I fell down about 4 or 5 steps. I sat there crying for about 5 minutes because of the pain before I tried to get up and hobble down the remain 10 or so steps and over to the car. I did the usual ice packs and such when I got home, but when I still could hardly walk the next day, after I went to class I went to the Doc in the Box because they had an x-ray machine and cost the same as going to my regular doctor instead of 4 times that to go to the ER for x-rays. I ended up with no broken bones, but I did have a high ankle sprain. They put me in a high boot for about 6 weeks. I finally got the okay to wear an ankle brace. I have been told to wear the ankle brace through November unless I am going to be on uneven ground, and then I am supposed to wear my boot, just to make sure I don’t re-injury my ankle or do more damage. I finished Human Geography and made a B in the class. 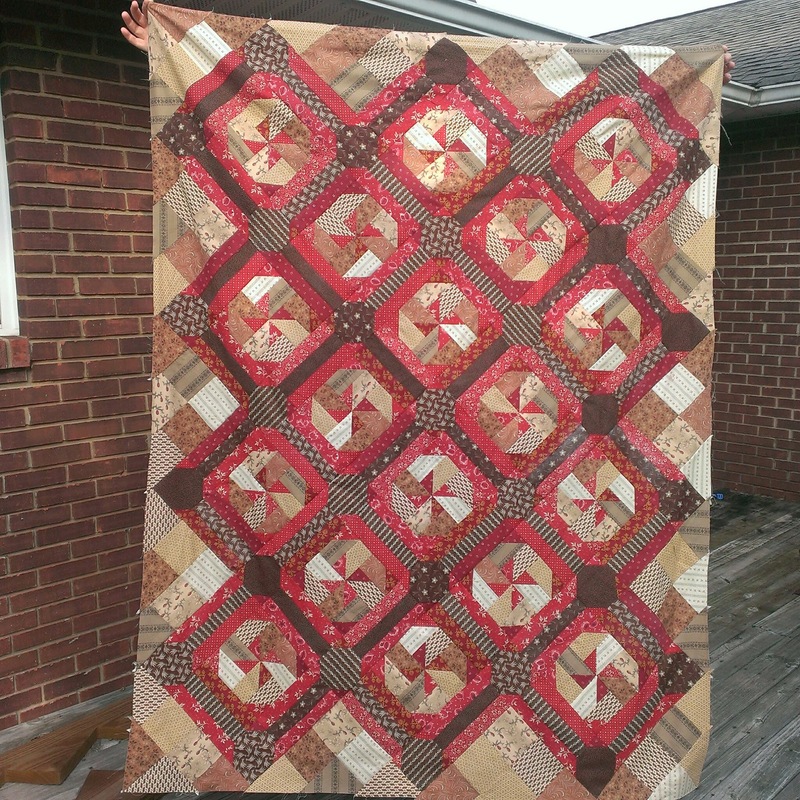 Update on quilting and school. 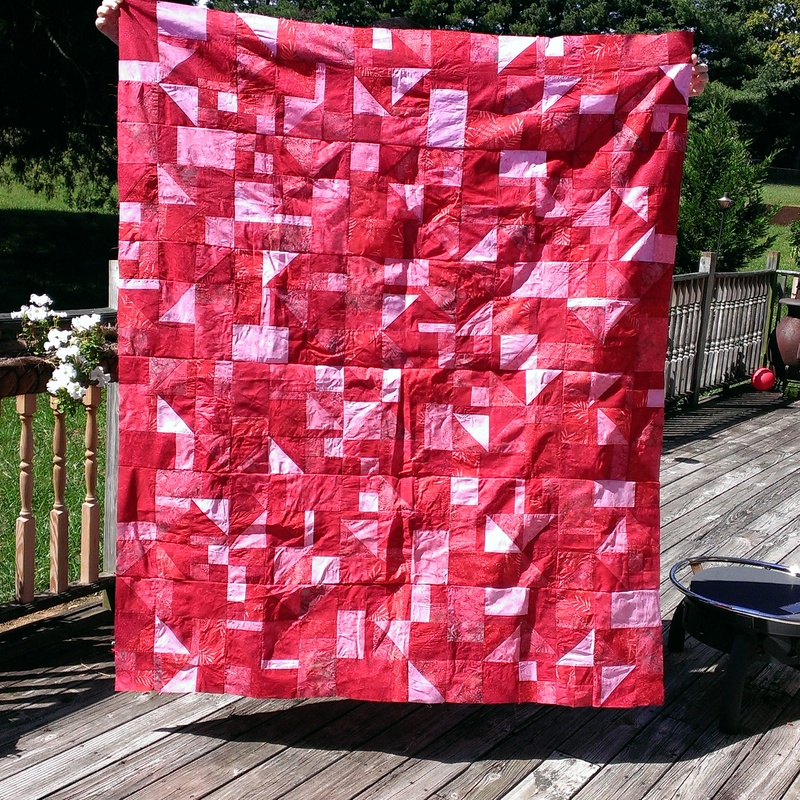 I have not done any quilting lately. I started school in January and I am taking 16 credit hours, plus I am still working part-time at Kohls. Side note, we had informed the person who were leasing to buy the house we were in that due to the fact our house in Alabama, that I had not found full-time employment and I had decided to go to college. That we would not be able to purchase the house in July, as was in our lease, we loved the house, but could not see closing on the purchase of it anytime in the near future and we knew she wanted to sell the house. We found another house for rent and signed paperwork in January to start moving-in in February. We informed her we would be out of the house in March. We scheduled movers and between what we moved ourselves and the movers, we had completely moved over by mid-month, etc for a few items and cleaning up of the other house. When I went to clean up, we had an ice storm hit that ended up closing all schools, including Tennessee Tech University. So I spent my unplanned break, running over to the old place, weather permitting, to clean and finish the little packing and moving, while studying to stay ahead in a few of my classes. I am going to be taking another break in my quilting, but I have the best reason for it. I have decided to go back to school. I am studying to take a Compass Exam to determine exactly how rusty my skills are and if I need to take some classes at the local Community College first to get my skills up to par for them. I am taking the Exam on November 19th. Once I have taken it, and passed, I will be accepted at Tennessee Tech as a Freshman in Accounting. 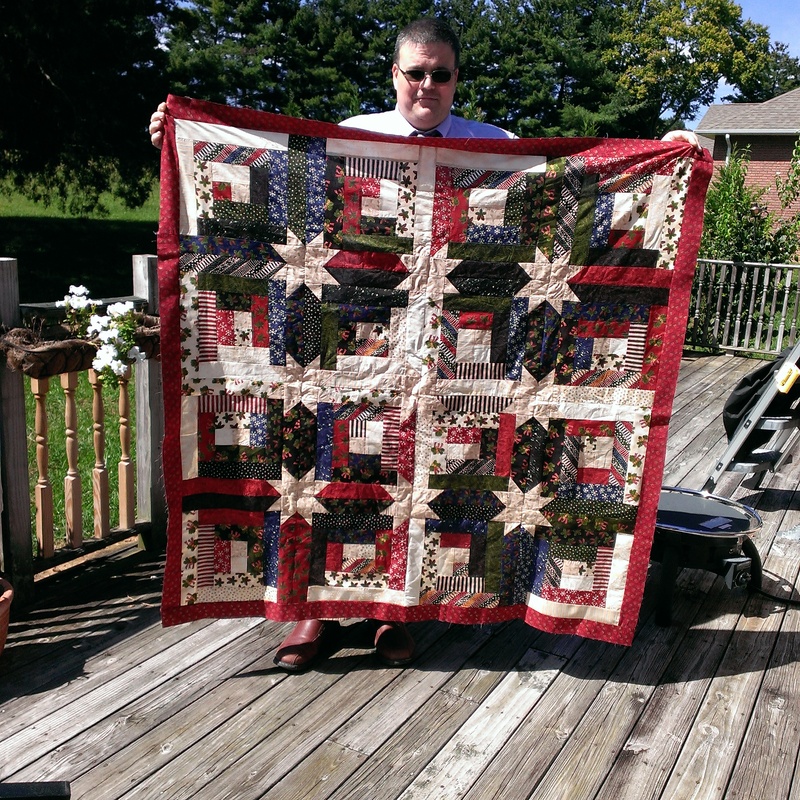 So I will be working on my quilting when I have time in between school, studying, homework, housework, etc. 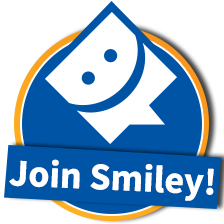 I had been toying with the idea of going back for a while, but I always put it off, with excuses that I was working full-time, with an hours drive just in commuting to work each way daily, and I had Xander’s scout stuff, etc. before and David was it school with his homework, so I didn’t really think we could both be working and studying, have dinner, clean laundry and have a clean house etc. Right now, with me working part-time for the season and unemployed otherwise, with us living so close to campus where David is working, it would be a lot easier to do. Now back to studying and getting my rusty skills back in working order for now. 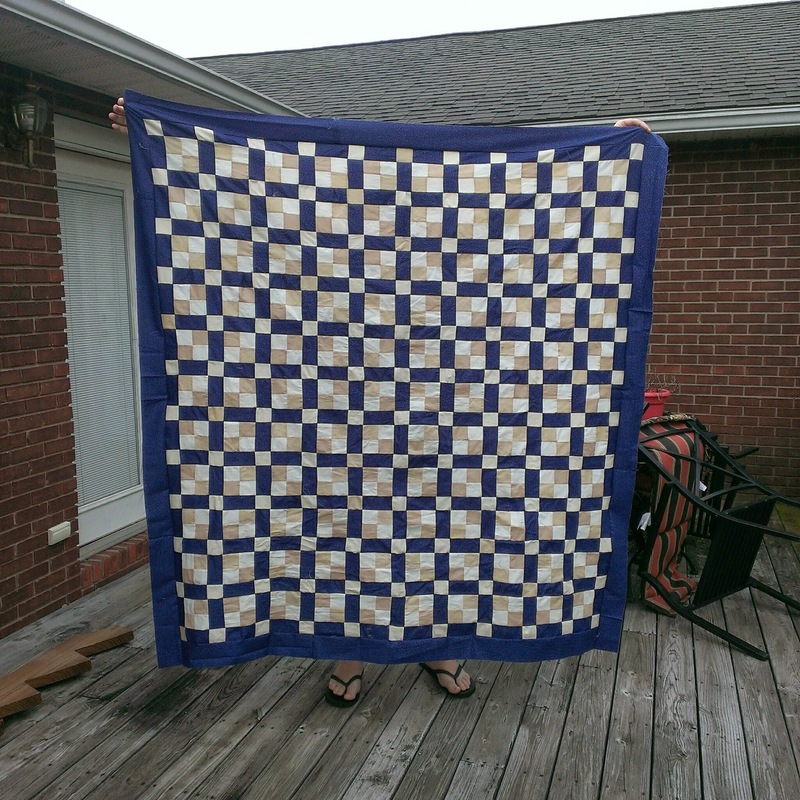 Another quilt done. This one is for David. It is called Blue Lagoon. We used a Creams Moda Jelly Roll and then yards of blue and reversed the blue with cream according to the pattern. As you can see it is almost big enough to cover David from over his head to his toes. Of course, Xander is trying to claim it as we speak. Very busy weekend in the Brown household. 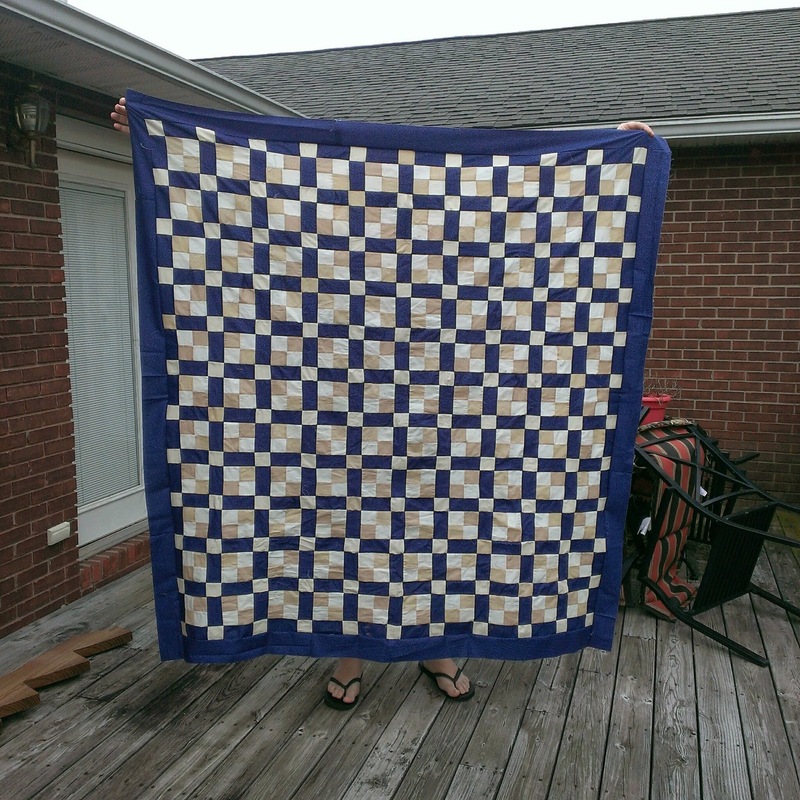 With David’s help, I completed 3 quilts. 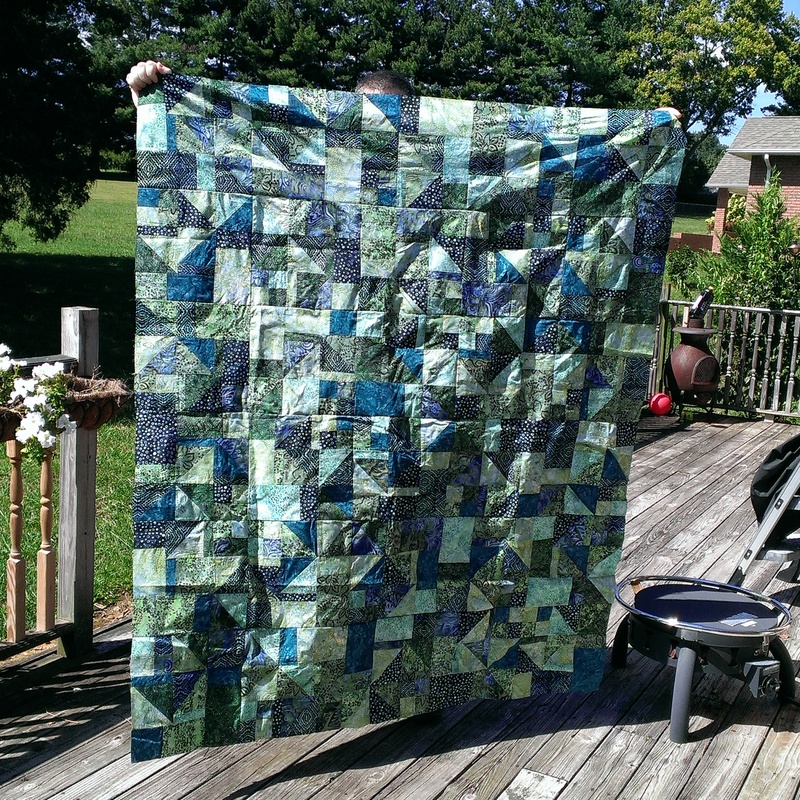 I completed 2 Gumball quilts pattern, 1 Red Batiks and 1 Green Batiks (both of which were purchased before we moved at Heart to Heart Quilt Shop before they Closed) the 3rd quilt was a jelly roll and material that we had bought (I think online) and used a pattern called Log Cabin Hidden Stars. David had pre-cut these before our move and had them all ready for me to start in their tubs. I was at my sewing machine all weekend and he watched football and ironed for me. Xander is claiming them as I make them. The Green Gumball and the Log Cabin Hidden Star were made for David and the Red Gumball was going to be mine but Xander claimed it. I now get to work on work on his David and Xander Jitterbug Quilts next. They asked for the same quilt pattern totally different color schemes. David picked the pattern and the fabrics, cut, did a lot of the ironing and helped lay it out and helped pin. Now onto the others that I have started working on.